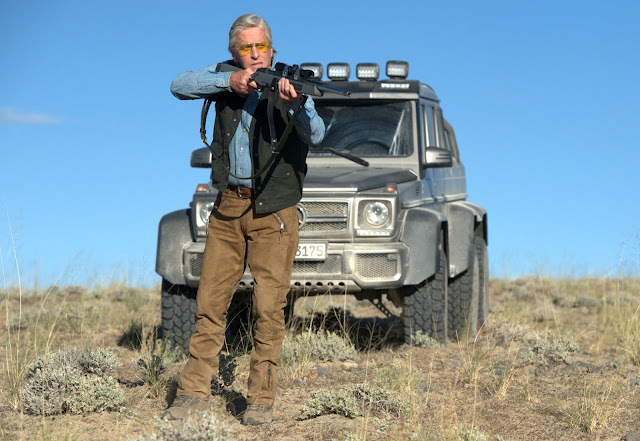 As Michael Douglas's career has progressed he's moved from conventional leading man roles to those more associated with a veteran character actor. Since his magnificent performance in Behind the Candelabra, Douglas has gone on to make some of his most intriguing work - something that continues with pulpy exploitation thriller, Beyond the Reach, a film with the makings of a stone cold cult classic. Filmmaker Jean-Baptiste Léonetti directs this adaptation of Robb White's 1972 novel Deathwatch, which follows high-rolling/unhinged businessman, John Madec (Douglas) pursuing his young hunting guide (Jeremy Irvine) throughout the Mojave Desert. The joys of Beyond the Reach are to be found in its simple, but gleefully pulpy plot proceedings. We see Douglas's Madec is kitted out with the highest tech - from state of the art weaponry to a suped-up four wheel drive Merc - and is involved in a shady Chinese business deal. Irvine's young Ben mopes as his girlfriend moves away for university and isn't in the best frame of mind when tasked with escorting Madec on his hunting expedition.After Madec "accidentally" kills a local prospector, sole witness Ben becomes the victim of a taut cat and move pursuit through the baking Mojave. With this simple narrative strand, Léonetti racks up the tension and the exploitative thrills as this deranged Wall Street titan pursues his handsome young guide. For good measure, there's some simmering cinematography from Russell Carpenter that captures the evocative barren landscape - as well as some well-handled moments of pursuit action and claustrophobic thrills - that makes Beyond the Reach an effortlessly engaging and deliciously over-the-top thriller. Léonetti has a solid eye for an action scene with pursuits through narrow rock tunnels and car-chases over the dusty terrain making a strong impression, but the real pleasure comes in the interaction between the film's lead stars. Douglas goes all out delivering a performance with conviction, yet still managing to revel in the campy fun. Dressed in a white stetson, yellow-tinted glasses and a brown waistcoat - the actor looks every bit the deranged hunter he plays, whilst Irvine is given less costume to work with when Douglas's Madoc decides the chase would be more fun if the toned-guide is pursued in nothing more than his boxer shorts. We agree MD. There's no pretentions of great dialogue here with the lines delivered by Douglas only boosting the campy spirit ie. "Fool me once, shame on you. Fool me twice, I kill you." Moments like Madoc blasting out classical music from his SUV as he surveys the landscape with a cocktail in hand secure Beyond the Reach's place as a tremendously fun cult thriller. 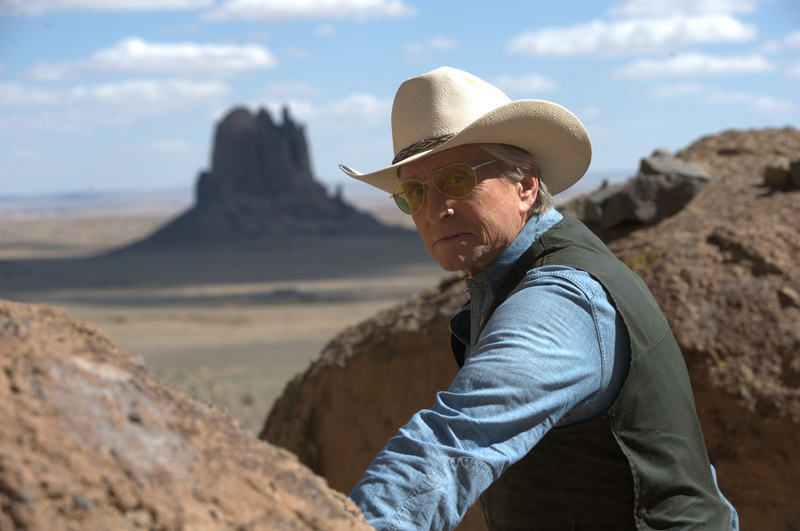 Beyond the Reach has no illusions of grandeur, instead delivering the exploitative camp that we'd hope for when watching a film that sees a white stetson-clad Michael Douglas hunt a semi-naked Jeremy Irvine in the desert. This is a surprising delight of 2015.